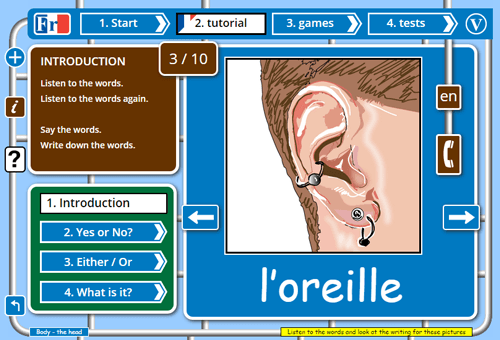 Each French lesson consists of 4 interactive learning activities and includes full audio by a native French speaker plus the written text for every item of vocabulary introduced. 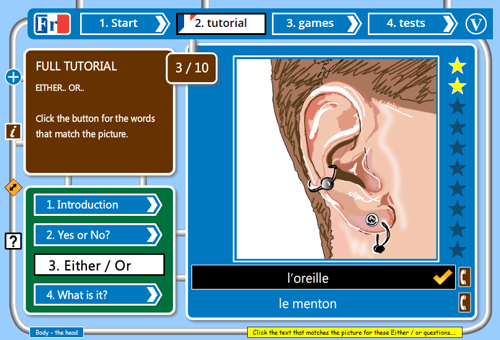 There are 2 levels of French lesson available, beginner and intermediate. The 4 activities in each of our French lessons progress step by step to help you the beginner gradually master the topic vocabulary. These activities are based on "3 stage questioning", a method of learning that quickly and easily builds your confidence as you work through a short series of lesson activities that strengthen your knowledge of the French that you want to learn. When you have completed the lesson for a topic, you should try some of our French games before finally doing the test for your chosen topic. 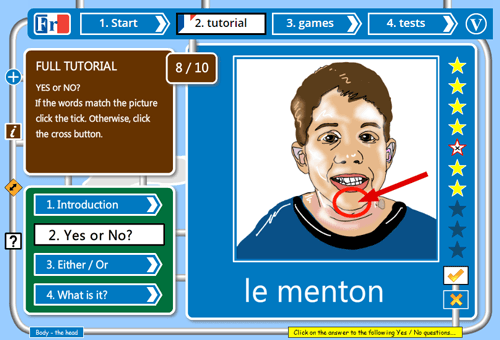 See the Help box below for detailed instructions on how to use our lessons to help you learn your French more easily. On the settings page select whether you want to do the "Full lesson" or a "Quick refresh" of language you have learned before (flash version only). There are also buttons to change the topic you wish to study, and to skip to the games section of the website. 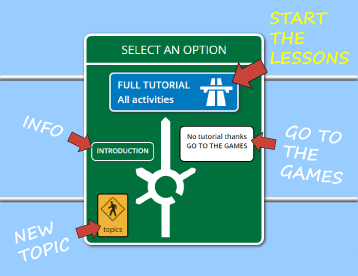 In the flash version you can click the orange double headed arrow on the left of the frame to make the lesson fill the screen (use the 'Esc' key to exit full screen). 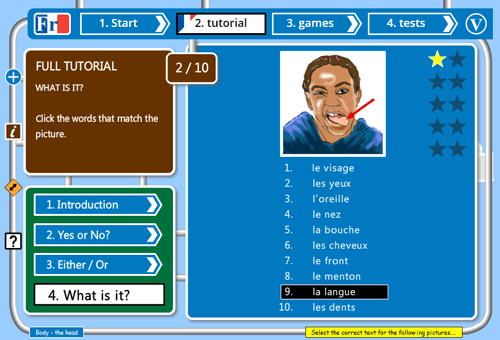 You start the lesson with an introduction to the French words or sentences you will be learning. You will see a series of pictures one at a time, and for each picture you will see and hear the French for that picture. You can repeat the French audio for the picture by clicking on the brown telephone sign. See an English translation of the text by holding down the brown "en" button. Move between items using the white arrow buttons on either side of the picture. Try to say the words after you hear them. Also write down the words you see on the screen. Writing down the words a few times will help you to remember the vocabulary even better than just saying it. To revise a topic you have learned before, select the Quick refresh button - the program will go through the pictures one at a time and play the audio twice for each picture while showing you the written words. You cannot control the speed of the presentation, nor can you go back and forth between the pictures. In this lesson activity, you will be shown the pictures one at a time. A voice will ask you whether this is a picture of... then play some audio and present the written words. You must decide whether the words match the picture or not. If you think they do, press the tick button. If you think the words are for a different picture, press the cross button. The program will tell you whether you are correct or not, then move on to the next picture. In the Full lesson you will be shown 10 pictures in the order that they were shown in the introduction; in the Quick refresh you will be shown 5 random pictures from the topic you are learning. 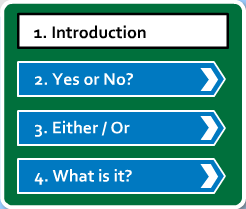 This lesson activity moves on from yes / no and offers you two possible answers to the question. So, you will see a picture then a voice will ask "Is this a picture of... or is it a picture of ..." and you will have to choose which of the answers is the one that matches the picture. You choose an answer by clicking on the written words for that answer. You can play the audio for each answer again by clicking on the brown telephone button beside the written answer. The program will let you know each time whether you answered correctly. The Full lesson gives you 10 questions in the order that you learned them. The Quick refresh shows you 5 random pictures from the topic you are studying. At the end of the lesson, you can choose whether to repeat that lesson or move on to the next one. The final lesson activity shows you many possible answers for each question and you must choose the correct one. You are shown a picture and below it are a list of all the possible written answers from this topic. Rolling over an answer will play the audio for that answer. For each picture, click on the writing that matches the picture. The program will tell you whether you are right or not. The Full lesson will show you 10 pictures in the order that you learned them. The Quick refresh will show you 5 random pictures from the topic. The written answers are always in the order that you learned them in the Full lesson. When you complete the "What is it?" lesson, you can choose whether to go on to play some games with this topic, or whether you want to repeat some or all of the lessons for this topic. You should expect to get 8/10 answers correct in most of the activities before going to the French games for this topic.